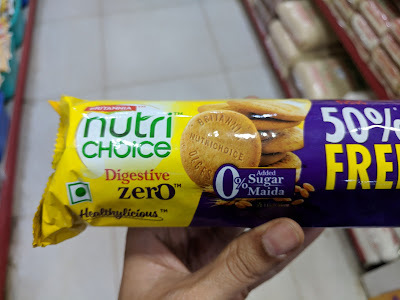 A few days back, I spotted a new variety of Brittania Nutrichoice digestive biscuits at a supermarket with a tag "zero" - zero sugar and zero maida. Needless to say, I was intrigued and started reading through the ingredients. On googling, I realized that this brand was launched a couple of years back. For people who repeatedly ask me why I call out wheat flour as maida, please check the first ingredient here. It is clearly written as "WHOLE WHEAT FLOUR". Maida is always stated as wheat flour or refined wheat flour. 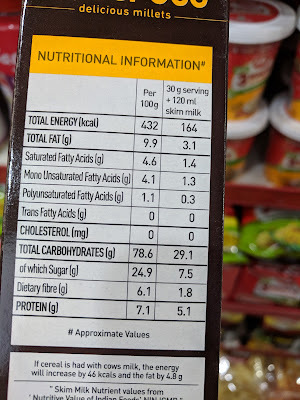 So yes, this pack of digestive zero contains NO maida, which seems to be a good thing. But let's go through the rest of the ingredients. 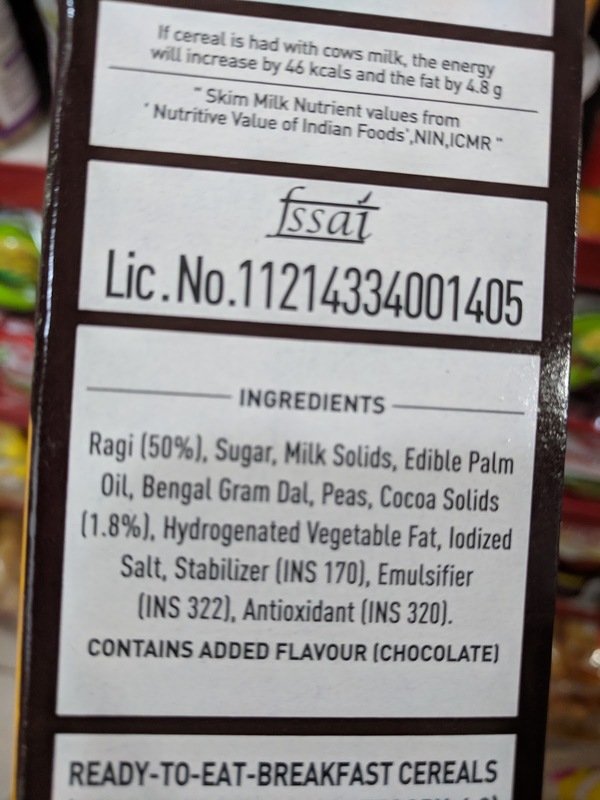 The second ingredient is palm oil - one of the unhealthiest and cheapest forms of oils being used by the food processing industry. 100 gms of digestive zero biscuits contain 21gm of fat, which is quite high (and on similar levels as that of McVities digestive biscuits). There are two different artificial sweeteners being used in this pack - maltitol (965) and sucralose (955). Maltitol is a sugar alcohol (a polyol) used as a sugar substitute. It has 2.1 calories per gram (white sugar has 4 calories per gram) and a glycemic index of 52 (table sugar has a glycemic index of 60). Since maltitol is a carbohydrate and contains calories, it affects blood glucose levels. Some of the side effects of maltitol include abdominal cramps and intestinal gas. 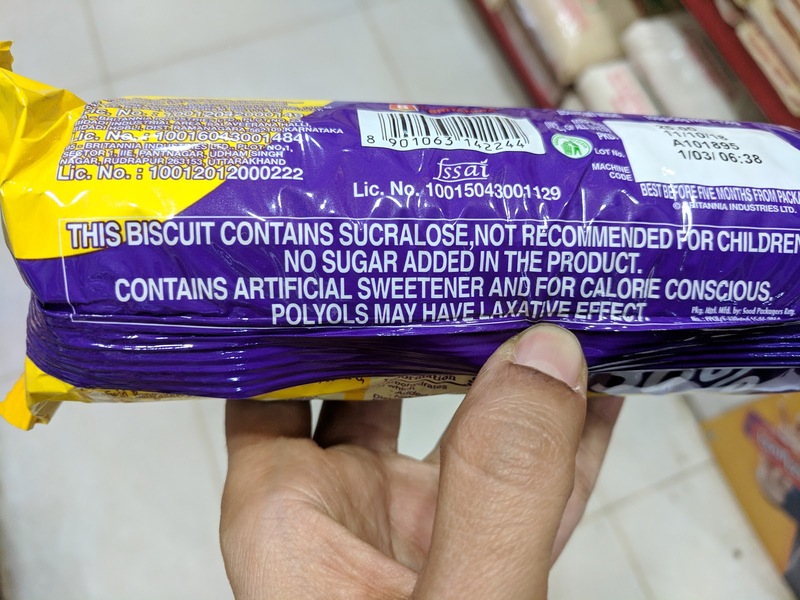 It is also mentioned in the pack - "polyols may have laxative effect". Being the third listed ingredient, it is strange why the brand is not explicitly calling out maltitol as an artificial sweetener. Let's look at sucralose. It is a zero calorie, artificial sweetener.
" One concern is that people who use artificial sweeteners may replace the lost calories through other sources, possibly offsetting weight loss or health benefits "
" Non-nutritive sweeteners are far more potent than table sugar and high-fructose corn syrup. A miniscule amount produces a sweet taste comparable to that of sugar, without comparable calories. Overstimulation of sugar receptors from frequent use of these hyper-intense sweeteners may limit tolerance for more complex tastes. That means people who routinely use artificial sweeteners may start to find less intensely sweet foods, such as fruit, less appealing and unsweet foods, such as vegetables, downright unpalatable. In other words, use of artificial sweeteners can make you shun healthy, filling, and highly nutritious foods while consuming more artificially flavored foods with less nutritional value. " " Artificial sweeteners may play another trick, too. Research suggests that they may prevent us from associating sweetness with caloric intake. As a result, we may crave more sweets, tend to choose sweet food over nutritious food, and gain weight. " Having observed a few family members who have been on sucralose for many years, I can see these patterns in their eating habits. 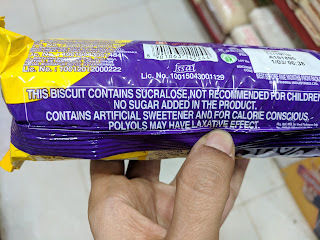 Just because they believe that sucralose is not sugar, they tend to add it to every damn thing - lemonade, green tea, idli molagapodi (no kidding). They drink 6-7 cups of tea/coffee per day, with sucralose as the sweetener. The moment they see sweet/dessert while eating out or at a family function, they pounce on such sugar treats first before the main course, sometimes even asking for a second serving. Continuous intake of sucralose has made them crave for more sugar. They don't like to eat natural sweet tasting fruits like papaya, watermelon etc. The only fruit they like to consume are those long, yellow Morris variety of bananas which are too sweet. They are struggling with weight gain, they have been on diabetes medication for decades now, with their health declining and dealing with various issues. 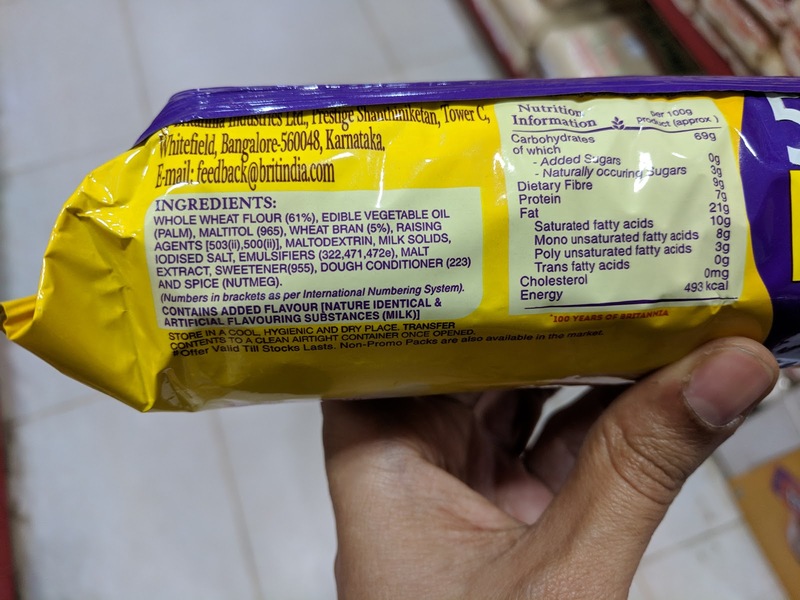 As with any packaged foods, these biscuits also contain a load of synthetic additives (the ones indicated in numbers) - raising agents, emulsifiers, dough conditioner etc. There is no point discussing each of these ingredient's side effects. The fact that it contains artificial sweeteners is more-than-enough reason for me to never buy this pack. If you would like to eat something along with your tea, avoid such fake biscuits. Instead eat a simple masala roti or thepla along with your tea. 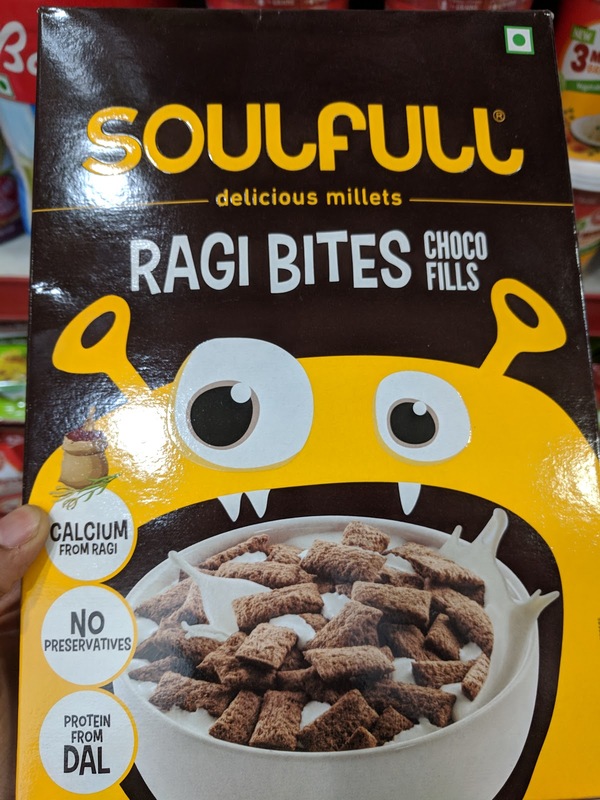 I wasn't planning to write a separate post on Soulfull ragi choco fills as I had earlier touched upon its ingredients in my post on Kelloggs Chocos. However, having seen how it is being promoted by mommy instagrammers, I decided that this product needs to be reviewed separately. It is being promoted aggressively as a "healthy" breakfast cereal and a "healthy" anytime snack for young kids. The brand and its digital aLLakkais (insta supporters) are pushing the product using the key ingredient "ragi". 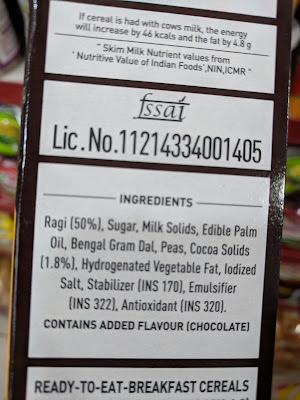 Yes, the ingredients list shows ragi as the first ingredient with 50%. What about the second ingredient - Sugar? Why isn't any of these mommies talking about the high sugar content (25%)? 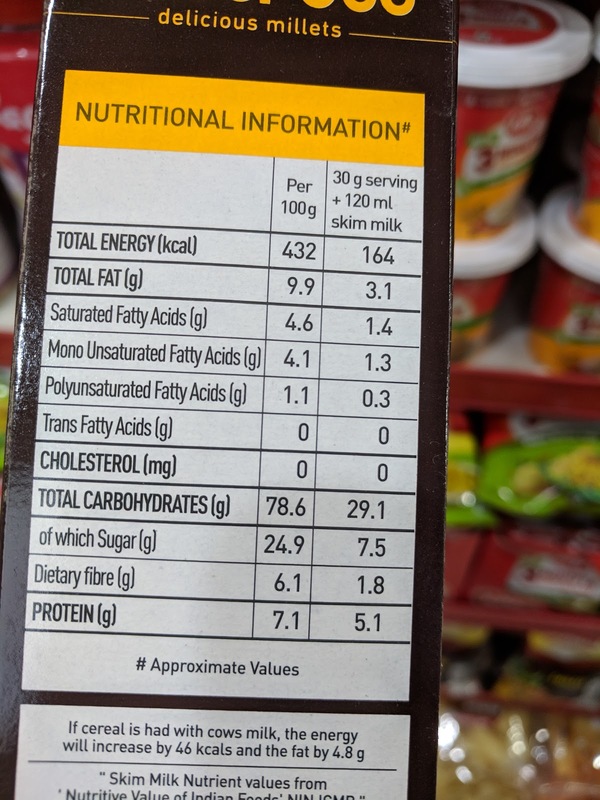 A 30gm serving contains 7.5 gm of sugar (close to 2 tsp). So if a child eats 2 servings a day (one for breakfast and one for snack), then he/she would have consumed 4 tsp of sugar (close to hitting the 5 tsp sugar allowance limit per day). Though the overall fats percentage is relatively low (10%), let's look at the fat sources - edible palm oil and hydrogenated vegetable fat. Both are unhealthy and causes inflammation in the long run. As with any packaged foods, there are additives added to increase shelf life - stabilizer (INS 170), emulsifier (INS 322) and antioxidant (INS 320), each having its own set of side effects in the long run. 100 gm of ragi wholegrain contains 11 gm of dietary fibre, whereas ragi chocofills (100 gm) contains ONLY 6.1 gm of dietary fibre. This is due to the fact that the processing involved in making those fills strips off the fibre. Let’s not rely on these packaged brands to give us the "goodness of ragi".